With summer in full swing, the last thing on your mind is your fireplace and chimney. Even though you don’t use them during the summer season, it is important to maintain them during the warmer months, so when fall rolls around they will be in good repair and ready to use. Safety is key with a fireplace and chimney. To ensure they operate safely and efficiently, it is important to keep them clean during the summer. At Ed’s Woodshed, we think safety is important and to ensure your fireplace will operate safely this fall, we have put together a few helpful tips to keep your fireplace and chimney ready for the colder months. Cleaning is a major part of fireplace maintenance. 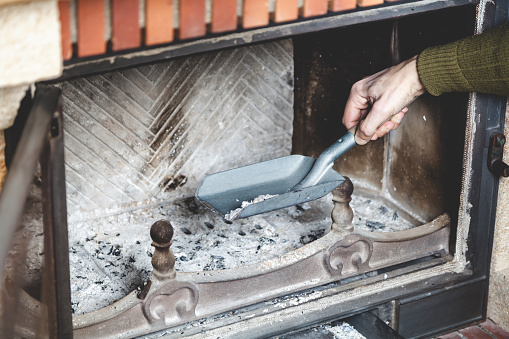 Pittsburgh’s harsh winters can cause you to use your fireplace frequently, so it is bound to need a thorough cleaning. Start by cleaning out the firebox. First, be sure the ashes are cool before you begin cleaning. You can remove the ashes with a shovel and bucket or a vacuum. After the ashes have been removed, you can continue cleaning the fireplace with a mixture of water and your choice of cleaning solution. Check to make sure the cleaner you choose is not flammable. If it is and remnants of the cleaning solution get left in the fireplace, it can cause issues in the fall when you use it again. Also, remove any soot and creosote buildup from the glass doors. By keeping your chimney’s damper closed, you can keep the cool air from your air conditioner inside, while also keeping out any bad odors that may enter your home through the chimney. Make sure it is completely closed to prevent any draft issues. A gas fireplace should also be serviced during the summer to ensure it will be ready for use in the colder months. At Ed’s Woodshed, we can check for issues such as loose connections that can lead to gas leaks and we can also service your unit to ensure it is working safely and efficiently. Schedule Your Chimney Sweeping and Inspection. If you haven’t had your annual inspection and professional sweeping yet, now is the time to schedule one to ensure your fireplace is ready for the fall. Regular inspections and sweepings are a crucial part of proper chimney maintenance. Pittsburgh is known for its very cold winter months, so it is important to properly maintain your chimney to ensure you are not left out in the cold this winter. At Ed’s Woodshed, we will sweep your chimney, removing all soot and creosote. We will also inspect your chimney for any damage. If any damage is found, we can repair your chimney so that it is safe you to use this winter. Contact Ed’s Woodshed today to schedule your chimney inspection or to learn more about our fireplace maintenance and service options.